Saunders was an etcher and illustrator, whose portraits of authors appeared regularly on the cover of the New York Herald Tribune book section. He was also a member of an avant garde group that included Dali and Magritte. 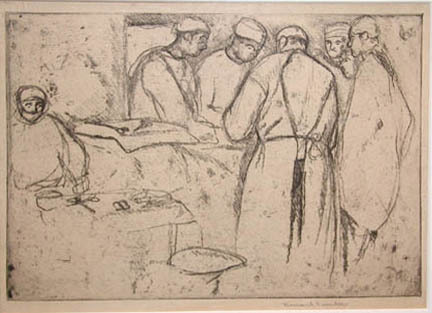 Sanders, Bernard, “Operation,” Westport Public Schools Digital Collections, accessed April 25, 2019, https://collections.westportps.org/items/show/1056.